Best known for BARBARIAN QUEEN and its sequel, she also appeared in FAST TIMES AT RIDGEMONT HIGH, DEATHSTALKER, AMAZON WOMEN ON THE MOON, THE HAUNTING OPF MORELLA and VICE GIRLS. Sadly, the general public may remember her as the actress Phil Spector killed, but I'll always remember her as the woman who took my exploitation movie virginity. "...the conclusion of the trial of mega-producer Phil Spector in Los Angeles. Spector, perhaps the most famous producer in the history of rock 'n' roll, was on Monday found guilty of second degree murder for the 2003 death of actress Lana Clarkson. It was the second trial for Spector after the first, held in 2007, ended in a deadlocked jury, and as verdicts go, it was something of a doozy: the 69-year-old producer may face life in prison when sentencing takes place on May 29th. Spector's been a part of some of the biggest recordings in the history of pop music, and controversy for him has been nothing new. Check out these fascinating accounts of the producer's involvement with both the Ramones and Leonard Cohen during the '70s--well past his commercial peak--for some eye-opening details..."
Based on everything I read (and common sense), the two holdouts are idiots. Personally, I think that crap like this happens too often. The judge should have held the jury. "You're not being dismissed until you have reached a verdict. I don't care if it takes years." They'll eventually get him. Should have happened during this trial however. 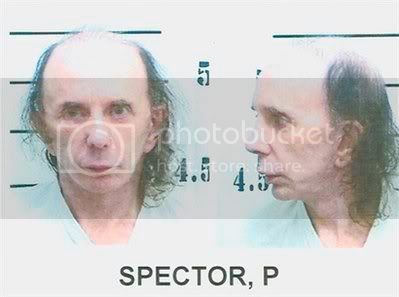 Phil Spector is a nutbar and has always been. He's also waved a gun around during studio sessions on multiple occasions. Yes, SPECTOR stories of gun brandishing are not uncommon; he's pulled a gun on people like JOEY RAMONE. You'd indicated "they"'ll get 'im. Done. Regardless of his talent...the guy was a spoiled brat who always wanted his way-and would resort to threats-and ultimely violence-to get it. He won't last long in the joint. F%ck 'em. I was worried he would get off. And so it ends. Thankfully, they got justice. Have fun in prison, Spector. They just looooooovvve rich and famous types down there. His story had more holes in it than swiss cheese. To quote RC, yeah "F*ck him". Don't bend over for the soap Spector. Phil won't be in general population. With all his money, he'll be in hell but can buy all the protection, booze, and drugs he wants. Glad to hear that justice is served. The weird thing about all of this is that it was predicted way back in Beyond the Valley of the Dolls. Russ Meyer and Roger Ebert based the freaky rock producer character on stories they heard about Spector. At the end, because they werent sure how else to end it, they have him murder the other characters in a drug-crazed Ciello Drive-inspired freakout. Going to trial is a crapshoot. Sometimes you get off, as in the case of O.J. Simpson. And sometimes you don't, as in the case of Spector. Though, it took them two times to convict him. What I think is interesting, the murder happened so long ago, if he had worked out a plea deal at the time it happened, say for voluntary manslaughter, he might be already out of prision. I presume he'll have his lawyers appeal his conviction, so it'll probably be awhile before he does serve his time, if he ever does. He's in jail already. They took him away in cuffs. If he was out awaiting sentencing or appeals, he'd be long gone. Welcome to your own personal hell, Phil.